Zotero offers word processing plugins for Word and OpenOffice. 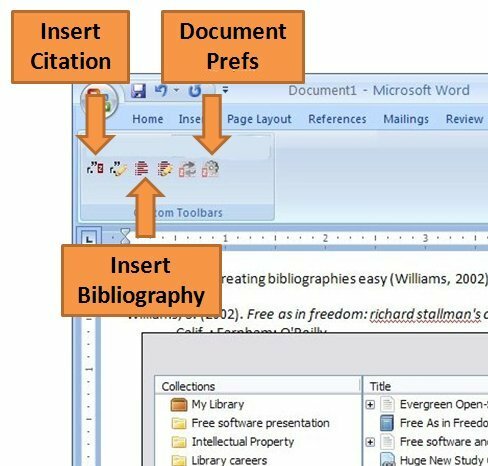 The plugin adds a Zotero toolbar to your word processor that allows you to add citations to your document while you write. To add a citation, click the first button ("Insert Citation") on the toolbar. Search for the reference you want to cite and press Enter. Zotero will add the citation at your cursor. At the end of your paper, click the third button ("Insert Bibliography"). Your bibliography will appear, and new citations will be added automatically. Change bibliographic styles with the last button on the toolbar ("Set Doc Prefs"). NB: The icon on the Mac will look different.